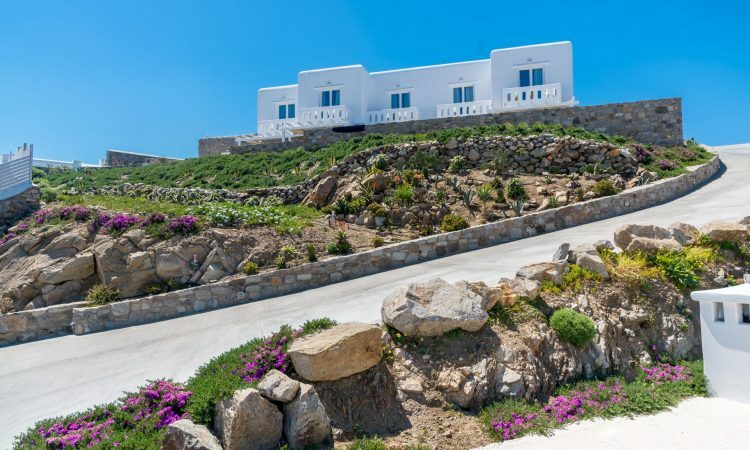 Near Megali Ammos beach stands the newly-built Cape Mykonos hotel. Designed with respect to Cycladic architecture that ensures the comfort and pleasant hospitality experience of its guests, the hotel is nestled on the side of a hill. The brown stone hues of the ground floor and the flecks of characteristic Cycladic white compose a harmonious setting that respects the discretion of Cycladic architecture and blends into the landscape.Enjoy fascinating views of the endless blue sea and of Mykonos Town with a refreshing drink in hand, either from your balcony or from one of the 27 luxurious, modern rooms of Cape Mykonos hotel. In the effort of providing high quality services and making your stay an unforgettable experience, Cape Mykonos offers a series of the finest services centered around you, the guest. Free Wi-Fi is available in all of the hotel’s common areas, as well as chambermaid and 10-hour reception service. Based on your needs, Cape Mykonos also provides babysitters, concierge services and breakfast, while guests can also use the washing machine. Comfortable and safe parking is also available.